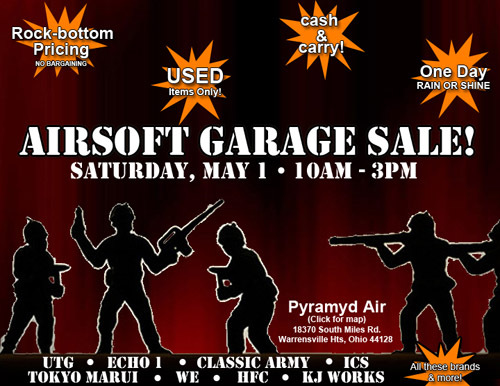 Pyramyd Air is having a garage sale with sweet Airsoft loot, to boot. If you're in the area, I suggest you stop by and snoop around. I'm told they've got some pretty nice stuff in good condition for cheapsies. Here's the official announcement for pomp and circumstance. Do you see the list of brands they'll have for sale? Yea, those would be good brands to buy. I like all of them. I'm serious. I could name AT LEAST one product from each brand that I think very highly of. Try me. I'm going to tell you something. Something about airsoft and buying used. You can often times find great deals this way. Half the fun of getting these guns is fixing them up with external and internal goodies and if you're planning on replacing over half your Airsoft rifle with aftermarket Magpul or VLTOR stuff, for example, why not buy a used gun to cut your cost down? The great thing about the stuff Pyramyd is selling is that even though it's used stuff, most of it is in pretty good shape and in some cases might just have a scratch or two on it, making it unable to sell at full retail yet still functions flawlessly. So. If you're in the area and you like saving money on your Airsoft acquisitions, I suggest you stop on by. I'm not saying those are the exact guns that will be at the garage sale, but I AM saying that it's certainly possible. That's a Tokyo Marui M9 Tactical Master for sale in their pre-owned section. Need I say more?